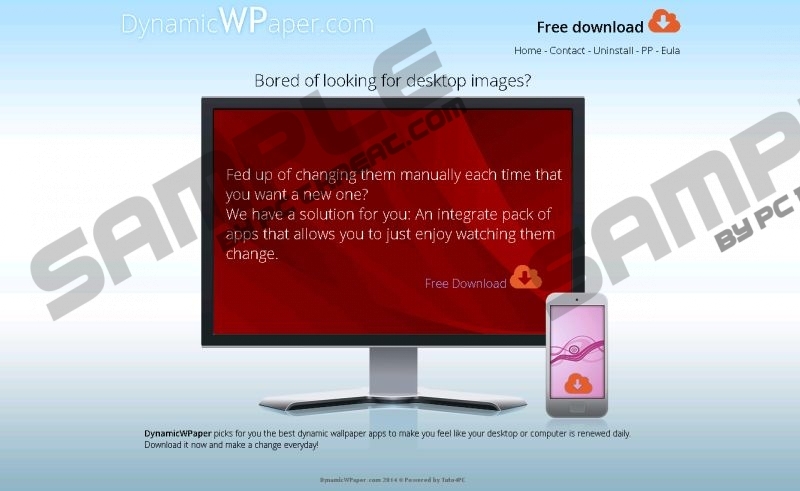 If you like to change your desktop backgrounds regularly, you may find DynamicWPaper to be a helpful program. It promises to change your wallpaper every day with a new dynamic image. But this application is not one that you should keep installed. It is created by a suspicious company that is responsible for unreliable products. DynamicWPaper is an advertisement-supported program that can display ads even when all of your Internet browsers are closed. We find such activity unacceptable even for a useful application. The usefulness of this adware program is questionable, so remove this piece of software and forget about it. Usually, adware programs attack you with annoying ads only when you browse the Web. However, DynamicWPaper can open your Internet Explorer, Mozilla Firefox, or Google Chrome browser even if none of them is launched at the moment. What you will see when your browser suddenly opens is a pop-up advertisement generated by this program. Most of the time, you will encounter an offer related to desktop wallpapers as the program will try to prove its legitimacy this way. But no legitimate application should be involved in such practice, and you should not allow DynamicWPaper to continue to act like this. Your browsing sessions will not be overlooked as well, and you will be bombarded with commercial offers and coupons each and every time you surf the Internet. The program places cookies on your device, and so can monitor your Internet browsing habits. For example, this application keeps track of what goods you buy online. It does that to provide you with personally customized ads, thus increasing the possibility that you will become tempted to click on them. But we must tell you that clicking on some of the ads generated by DynamicWPaper can expose you to malware distribution networks. Of course, the worst can happen only in rare cases, but it is better to remove the reason behind those ads so as not to encounter them anymore. Another reason not to trust DynamicWPaper is that its creator Tuto4Pc stands behind another potentially dangerous application. Not long ago, we focused on Emotypecon, another product developed by that company. You should not keep programs from Tuto4Pc on your computer. New wallpapers and new emoticons are surely not worth risking your online safety. Elimination of this application is a primary task that any person who cares about his online safety should accomplish. Fortunately, this task will require only a couple of clicks. We have prepared short instructions that should help you remove DynamicWPaper. But do not think that since this adware program is gone, you are 100% safe from further threats. You need to be sure that no other invasive application is residing on your system. So, you will need an authentic antimalware scanner to check every corner on your computer. If you do not know which tool has proven to be a successful defender, then feel free to ask us. You can post your question or comment in the box you will find below or address us via our social media accounts. Select DynamicWPaper and remove it. Access the Start menu and proceed to Control Panel. Launch Uninstall a program and delete the unwanted application. Open Uninstall a program and uninstall DynamicWPaper. Quick & tested solution for DynamicWPaper removal.